Hi babes! Welcome back to my blog. I know it has been a MINUTE but I've been sooo busy with other projects *cough cough* my workout program *cough cough* ;). BUT I am back and so excited to share my recent stay at CHIC Punta Cana by Royalton in Dominican Republic! Let me start off by saying that I have been to Dominican Republic A LOT - about 7 or 8 times, actually. It is one of my favorite places in the Caribbean and when I go I always stay all inclusive. It is the absolute best thing you can do if you're looking for a stress free vacation and get the most bang out of your buck! When booking an all-inclusive you typically pay for everything upfront. We usually book a package that comes with the flights and it comes out so much more affordable than booking them separately. Other than the flight, the package includes hotel stay, unlimited FOOD (girrrrl.... this is THE BEST), unlimited drinks (this includes all the delicious cocktails you dream of sippin' on the beach), entertainment, room service, and more. Once you have tasted this freedom... it will be obvious to you why it is SO WORTH IT. We always take some cash to tip the servers and bartenders at the resorts, and some more just incase we want to do excursions, but that's IT! You pay for everything else in one payment upfront and you don't have to worry about paying for drinks, meals, or anything else. This is the BEST part about all-inclusive - you can actually just enjoy your vacation without thinking about money at ALL. The Room: When we checked into the resort and were shown to our room, my jaw DROPPED. We got a suite that had a living area with a TV, couch, mini fridge, coffee-maker, and even our own LIQUOR DISPENSER with premium brands. You open up the sliding doors to the most posh bedroom you'll ever set your eyes on - and that in-room tub was to die for. The bed was soooo comfortable it was difficult to get up in the mornings. Everything was clean and comfortable, and we were greeted with a bottle of champagne and fruits. The People: They made us feel like ROYALTY but like old friends all at the same time. The people working there are so friendly. They are always joking around and having a good time, but they are so quick to get you anything you need or help you with an issue. Our butler, Johan, was amazing. He even offered to bring Jonathan clothes when his luggage got lost (yeah, that is a WHOLE other story). Everyone there was always smiling, always happy, and having a good time. The Drinks: The drinks here were fantastic. 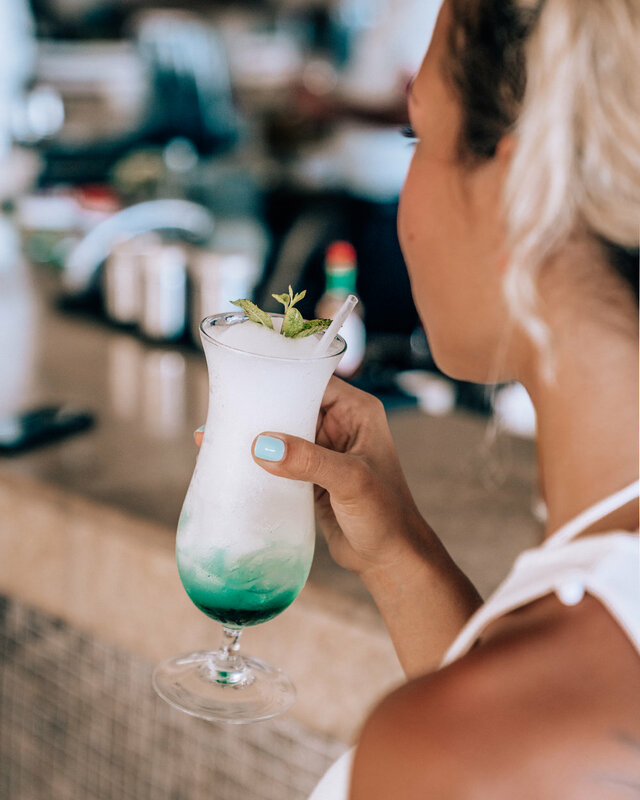 Many times we've experienced resorts that tend to skimp on drinks and use cheap syrups and liquors, or they have them pre-mixed. But here everything was so fresh - all the mojitos were made by hand and were so good. Our favorite bartender, Basilio, was so sweet and made the yummiest drinks - he even made us one of his super secret recipes! We liked him so much we promised him we would fly him out to our future wedding. The Food: CHIC has 4 Restaurants each with a different theme (Italian, Steakhouse, Ceviche + Sushi, and Middle Eastern). There is also a buffet with International cuisine, a sports bar, a snack bar and cafe. We only ate at 3 of the restaurants and went to the buffet for breakfast and lunch. They were all so good but the best by far was the Italian! We literally ordered like 5 plates each because we couldn't make up our minds and they all surpassed our expectations. The buffet was actually really impressive - the food was fresh, and it even included clams, some lobster, caviar, and more. The Grounds: Everything in the hotel is super modern and luxurious. We barely spent time by the pool because we are total ocean babies and love the beach. We were part of Diamond Club so we had access to an exclusive part of the beach that had daybeds. Of all the resorts in Punta Cana the beach in this one was my #1 favorite. The water was so clear and the beach was so clean with super soft sand. There were also some waves which I love! There was only one resort next to CHIC, so the beach was not crowded at ALL, on one side of the resort it is just untouched beaches and wilderness. It felt totally secluded, which you don't find often in Punta Cana. The one pool we did swim in was the Mermaid Pool, which is open to Diamond Club members - a.k.a the COOLEST POOL EVER. It is a rooftop pool on the second floor above the snack bar, so from the pool you can look over the whole resort and the beach. The walls on the sides of the pool have a huge glass window so people can actually see you swimming inside! Time to live out your mermaid dreams. This post was sponsored by CHIC Punta Cana, but all opinions are always 100% mine.